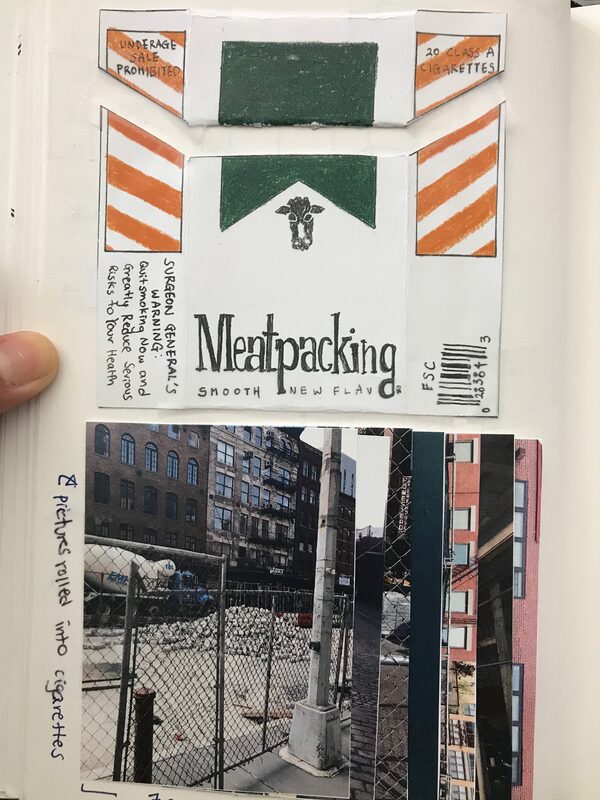 I chose to explore the Meatpacking District for this project and spent many hours taking in the environment in this area. In the beginning, I had a different idea for the project. I was thinking of a diorama or an actual model of a deal pig that was hanging from a hook like how butchers have them, because I was exploring the MEATPACKING district. I wanted to emphasize the name. 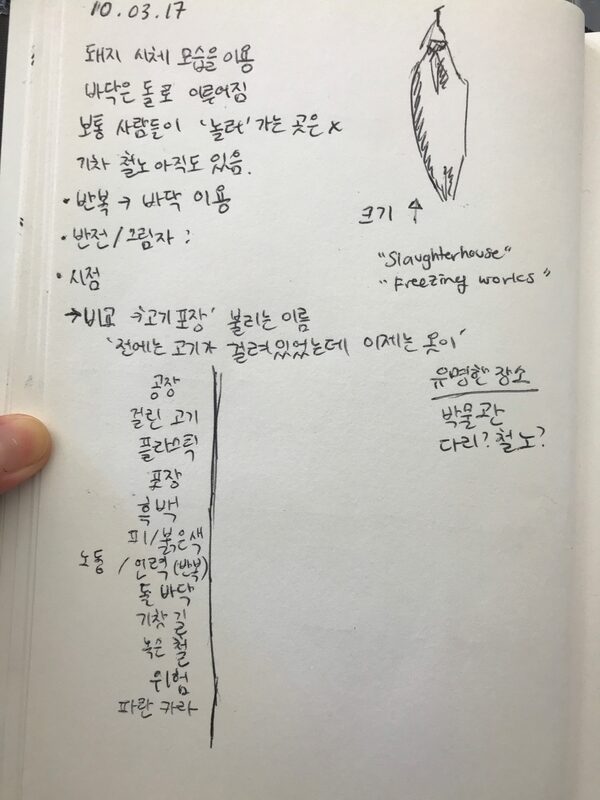 I listed things I saw and took pictures of that I could use to sculpt the model. Then. I changed my mind and went into another project I thought was more fit for this district. I noticed that the Meatpacking District was trying to change. Once you’re in the area, you would become enveloped in bright orange and green due to the places that were under construction. On my first day in this area, I picked up the trash I found on the ground. I found pigeon feathers, left over food, candy wrappers and so much more, but what I found the most were cigarette butts. This was because the whole area was under construction and the people who were working would smoke. 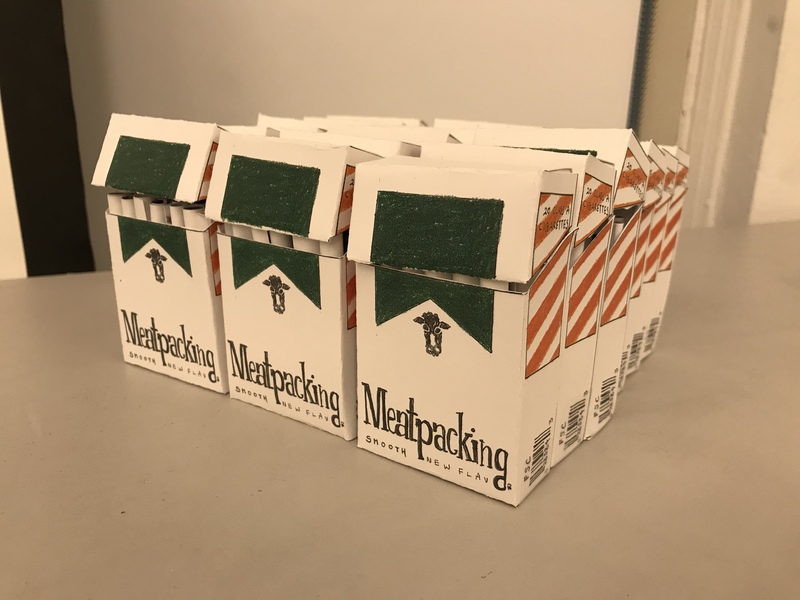 After my discovery, I smelled the cigarettes everywhere, and I noticed every person who had a safety hat on were either working in the construction or smoking. From this discovery, I wanted to show the viewers a different experience that would make let them use as many senses as possible. 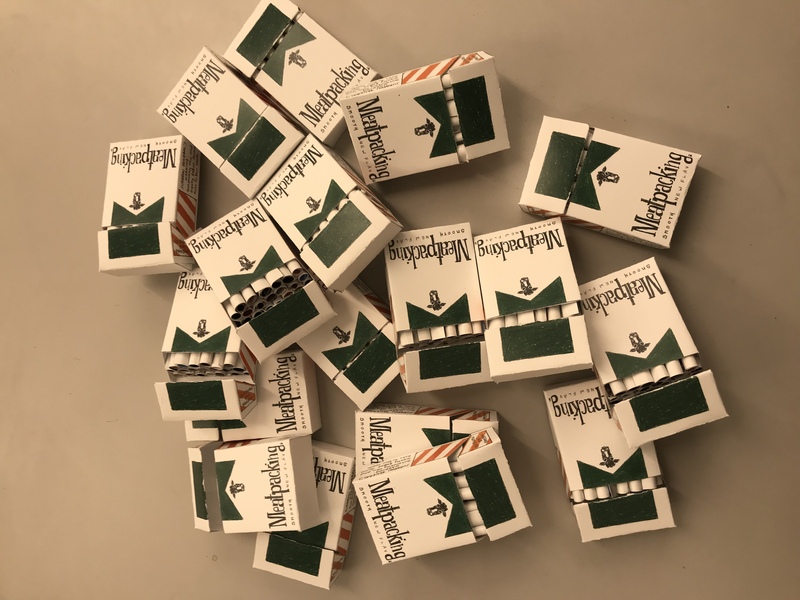 I made a pack of cigarette for everybody of the class, so it could be more intimate and personal. 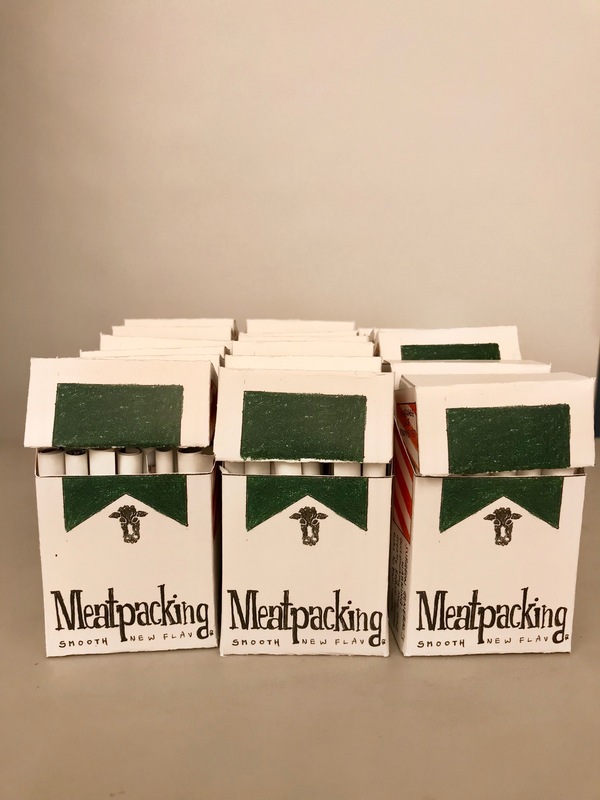 In this pack of cigarette, there were 20 pictures I took of the Meatpacking District rolled up like actual cigarettes. 10 of these photos were the places that were under construction, and the other 10 were shiny windows of shops that had already gone through this places. I wanted to show the contrast in this area. 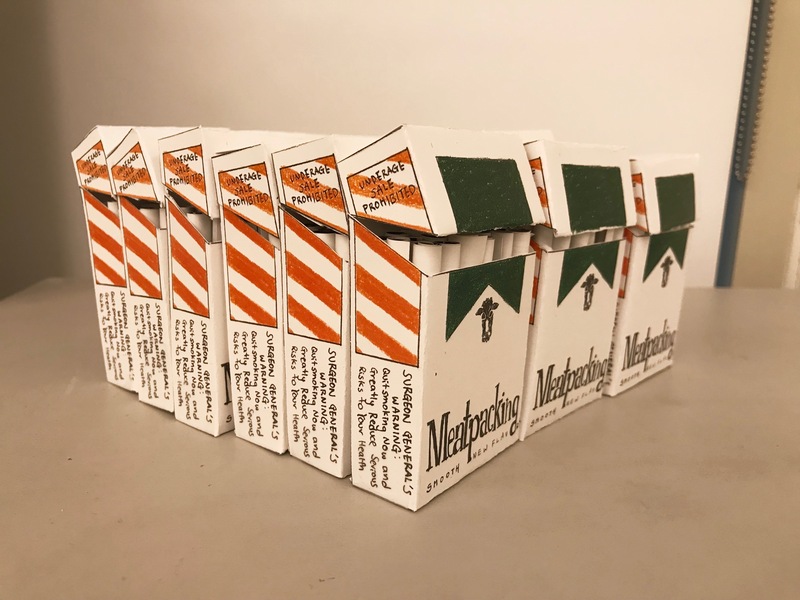 Then, when I was gluing the packets together, I mixed in the cigarette dusts from the cigarette butts I picked up, to the glue so when the viewer was close enough the packet, they could smell the faint scent of smoke. 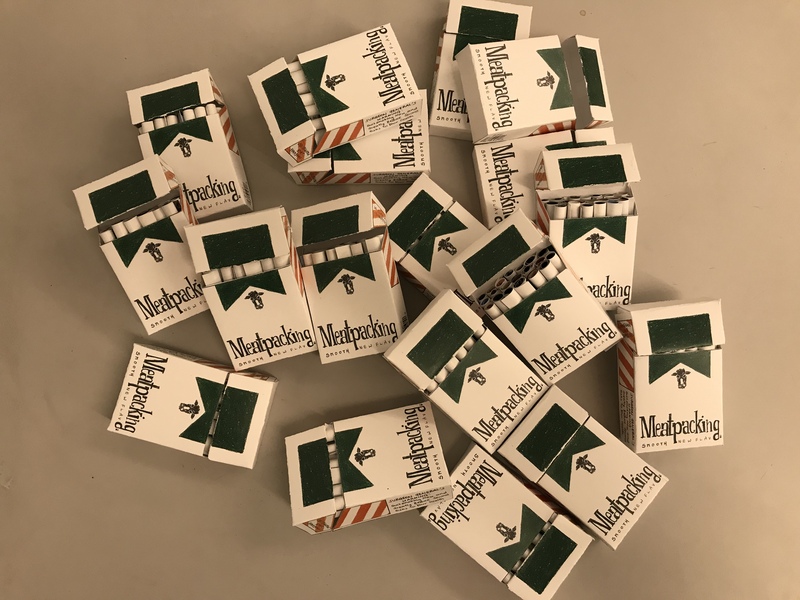 Once I was done prepping for this project (cutting out the pictures and putting the packets together), I took everything to class and started rolling the cigarettes in class. This was part of the project since I wanted everyone to see how this was created. Also, I wanted to show that labor intensive, factory-like part of this project. So, in class I finished rolling a total of 340 picture cigarettes, packed them up and handed them out to everyone. 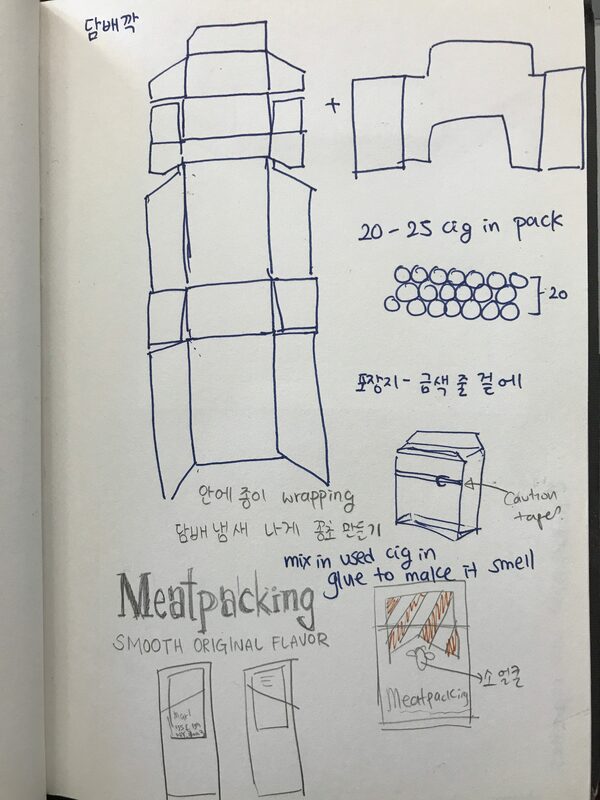 Seeing the 18 packets of cigarettes, I like how it was almost like real cigarettes that were sold, because there were so many of them.